Today’s daily newspaper’s Political Insider column includes this bit of inside politics: Scroll down to the item titled, Honey, the governor‘s on the phone….detailing the territorial wars between the elected District 11 conservative precinct committeemen and the liberal element misrepresenting itself by use of the genuine sounding name Grassroots Arizona. Last week brought an intensification to the conflict with a national figure entering the fray. Mississippi Gov. Haley Barbour, the former chairman of the Republican National Committee, recorded a 30-second auto-dialer message that went to 5,000 district homes. An additional 5,000 households are expected to receive the call Monday, the day before the primary election. In the eye of this storm, along with the longstanding PCs whom the McCain surrogates want to oust, are party stalwarts, Maricopa County Chairman, Tom Husband and the District 11 Chairman Rob Haney. Refreshingly, neither of these men shrink from calling out the elephant in the room when need be. Grassroots Arizona PAC already has flooded the district with mailers advocating on behalf of its slate of recruited and often unsuspecting PC candidates. Not all of their recruits were pleased with the inclusion on their suspect list. Former Sen. Tom Smith strongly denounced their practices at the August district meeting. There is no doubt that this effort came directly from the McCain campaign. Haley Barbour is too high in the upper echelon of the GOP to accommodate low level PC requests. John McCain also lives in the district and has been embarrassed in the past when the elected precinct committeemen objected to his liberal policies on various issues, most significantly the Comprehensive Immigration Reform/ Amnesty bill. Big money interests in the state that benefit from taxpayer subsidized low cost illegal labor seized the opportunity to silence the voices of the opposition. As a presidential candidate, John McCain wants to ensure that a repeat of such displeasure with his policies doesn’t re-erupt. The means being employed by his surrogates is to shut down the conservative leadership within the party. U.S. District Judge Roslyn Silver has ruled that a key provision of Arizona’s public campaign financing system violates constitutional free speech rights. Judge Silver issued the ruling Friday in a suit filed last week by the Goldwater Institute on behalf of six Republican legislative candidates. The suit asked the judge to bar the state Clean Elections Commission from paying so-called “matching funds” to candidates who are outspent by opponents who don’t sign up for state financing. The Rocky Mountain News reports that Judge Silver refused to grant a temporary restraining order blocking the state from issuing matching funds, which could affect Tuesday’s primary election. She wrote that the late challenge to the law hasn’t given either side time to present evidence. Silver set a hearing for Wednesday to consider issuing a preliminary injunction or to hold further hearings. Still, the ruling could have a major impact in November’s general election. If Silver issues a preliminary injunction, candidates who opted not to take public financing could spend as much as they want without worrying that their opponents would get a supplemental cash infusion from the state. “We think yesterday’s ruling was a victory for free speech rights,” said Goldwater Institute attorney Clint Bolick. The so-called “Clean Elections” system creates a playing field that is skewed toward candidates that accept taxpayer’s subsidies and against those who raise voluntary contributions. We are cautiously optimistic that the matching funds provision will be invalidated in the near future,” Bolick said. The heavy-handed system is plagued with inequities, and voices have rightfully been raised against it since its inception in 1998, when it was passed by Arizona voters. However, there is a strange and unifying whiff emanating from some of the plaintiffs in the case. Those who sued include incumbent Republican state Reps. John McComish of Phoenix and Nancy McLain of Bullhead City. But others are new GOP legislative candidates Frank Antenori, Tony Bouie, Kevin Gibbons, and Doug Sposito. At least some (check the links) of these candidates are on the receiving end of large donations from those who oppose Arizona’s Fair and Legal Employment Act, commonly referred to as the employer sanctions law. The deep-pocket donors, business entities who rely on a steady stream of exploitable illegal laborers, clearly do not want conservative candidates enacting laws to secure the border. Neither do they want such candidates to benefit from their generous cash infusions into the campaign coffers of their business-as-usual hopefuls. Alaska Gov. Sarah Palin, just selected as the GOP running mate for presidential candidate John McCain, has a political dissident or two under her own roof. Alaska’s Republican Party allows those registered undeclared and “nonpartisan” to vote in the party’s primaries. The daily has made its endorsement in the District 6 state legislative race. Although the newspaper gets it right with strong conservative Rep. Sam Crump, it falls far short on assessing candidates for the open seat, Carl Seel and his ethically challenged opponent, Tony Bouie. The paper, in attempting to malign Carl Seel’s involvement with the Minutemen Civil Defense Corps, actually reveals how in sync Seel is with 75% of voters who passed restrictive illegal immigration legislation. Seel, immediate past chairman of the conservative PAChyderm Coalition, is in good company, since the monthly meetings are routinely attended by a large number of state Republican legislators. Congressman Trent Franks was a recent guest, as was Arizona Republic columnist Robert Robb, who just addressed the August meeting. The daily refers to Seel as a “political newcomer in the sense that he has never been elected to office…” This is an inane assertion, considering Seel currently serves as an officer of the Arizona Republican Party and is an elected state and precinct committeeman. A tireless grassroots GOP worker, Seel has personally recruited over one-third of the entire membership of the precinct committeemen in his legislative district. Tony Bouie, as a lifelong Democrat has only recently attended two Republican district meetings. First, in June, where he astonishingly announced his intention to run for a House seat and again last week where he was pressured to participate in a candidate forum at which he was ill-prepared to address fundamental Republican principles. A former football player, he constantly referred to his familiarity with the game to draw political analogies. Bouie refused to attend the Clean Elections debate in which Rep. Sam Crump and Carl Seel participated. Bouie did attend one community debate at which he lied to the voters and withheld other pertinent information. It is preposterous that the Republic makes this questionable endorsement after having documented his many lies during his interview with them and the Capitol Times. With today’s endorsement the daily newspaper excuses Bouie’s foreclosure, quarter million dollar bankruptcy and run-ins with the law. “Traditional Republican values” has comically now become a concern of the left-leaning Arizona Republic. The Arizona Civil Rights Initiative campaign led by former California educator Ward Connerly announced it was abandoning its lawsuit to overturn the state’s decertification of Proposition 104. The campaign issued a statement saying it still believed it collected enough valid petition signatures to put the initiative on the November 4, 2008 ballot but said it couldn’t review all the signatures rejected by election officials in time, according to a report in the daily. The proposed Amendment was classic in its simplicity. A new effort to amend the Arizona Constitution will be readied for the 2010 ballot, the campaign said. “Arizona voters will have a chance to vote on this important issue. Read Michelle Malkin’s take on Connerly and his efforts here. What say you, Mr. Bouie? 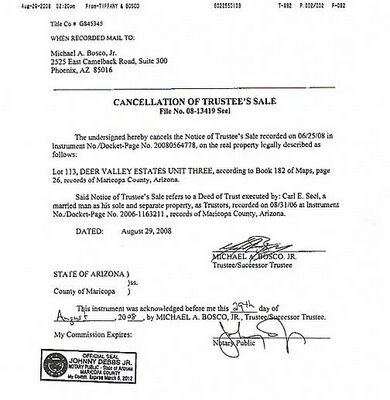 Seeing Red AZ has received a copy of the cancellation of notice of trustee’s sale on property owned by Carl Seel, despite a misleading mailing sent out by Tony Bouie to the contrary. This document clearly indicates the Seel matter has been resolved. Mr. Bouie has yet to publicly address his own problems. Seeing Red AZ appreciates the corroborating coverage of the bizarre state legislative campaign in District 6 by the Sonoran News. Investigative reporter Linda Bentley details how lifelong Democrat, Tony Bouie, perfected a quick registration switch to become an instant Republican and found himself the beneficiary of adoration by the open borders crowd and even a congressman or two. This would read like a Grade B farce, except for the serious, real life implications. Many of the district voters have already cast their early ballots, unaware of the charade that Tony Bouie has set out to perpetrate upon them. “For some bizarre reason, Mr. Bouie has attempted to start his political career by lying to the voters. This demonstrates a serious character flaw that is unacceptable and I call on Mr. Bouie to immediately withdraw from this campaign,” said Crump. You are currently browsing the Seeing Red AZ blog archives for August, 2008.